If you travel with an MP3 player, portable speakers, electric shaver, flash light or digital camera that runs on AA or AAA batteries, you should seriously consider getting yourself some good rechargeable batteries and a charger. The latest rechargeable batteries last longer in most devices than standard alkaline batteries and you end up saving money by not having to buy new batteries, which can be much more expensive when purchased abroad. There are a few different chargers to consider, the best one for you depending on whether you want pure portability, great features or something in the middle. All these chargers will work on electrical currents ranging from 100V to 240V so it’s safe to plug them in anywhere in the world (though you may need a plug adapter, of course). All of them are “smart” chargers which will stop charging the batteries when the charging is complete, a much better solution than older, cheaper “dumb” chargers which often use a timer and can thus overcharge your batteries, potentially shortening their lifespan. If want to travel as light as possible, this Sanyo USB Charger may be your best option. It’s the lightest and slimmest charger of the bunch at 93 x 47 x 17.5 mm or 3.7 x 1.9 x 0.7 inches and only 43g or 1.53 ounces as measured on our scales. It’s unique from all the chargers below in that it’s powered by USB, such as from the USB port on your laptop, although you can also power it with any wall charger or other device with a standard USB port. It comes with two top-notch AA Eneloop batteries and can charge one in 140 minutes or both in 280 minutes, and one AAA Eneloop battery in 60 minutes or two in 120 minutes. Note that if you choose to use your laptop to power this charger, it may need to be powered on (not in suspend mode) for the entire length of the charge (unless it’s a newer laptop that provides power to the USB ports even when it’s asleep and plugged in). For this reason, you may want to get a simple USB power adapter of some sort, such as this dual-port USB AC charger . Alternatively, if you’re bringing a phone charger that has a mini USB plug, you could use a simple USB adapter to convert it to a standard USB Female plug, allowing you to use your phone charger as the power source for charging your AA batteries (but test this setup before traveling to make sure it works with your phone charger). This charger is a good mix of features and size. It can charge batteries one at a time and has temperature monitoring so your batteries should never get too hot. More importantly, it has a refresh function, a feature where batteries are fully discharged and then recharged, which is useful for reviving old batteries that are losing their ability to hold a full charge. 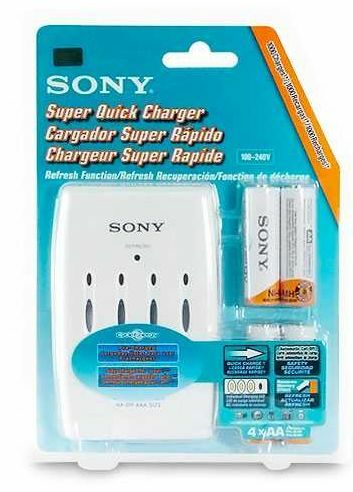 It comes with four Sony Cycle Energy Blue 2000mAh AA batteries, which are low self-discharge batteries similar to Sanyo Eneloops (and may even be rebranded Eneloops). Charge time is 2.5 hours for 1-2 batteries, 5 hours for 3-4 batteries. It’s compact at 105 x 65 x 30.5 mm or 2.63 x 4.25 x 1.2 inches and weighs 110g or 3.9 ounces as measured on our scales. (If you’re going ultralight, you can easily remove the front cover to bring the weight down to 3.38 ounces or 96g.) The power plug folds out from the back of the unit which is ideal for travel (no separate cord). You can take a look at the user manual here. It’s generally available from Amazon for around $30-$35. The La Crosse BC-700 is a dream charger for battery geeks. This is the least portable charger mentioned here due to its size of 130 x 76 x 38 mm or 5.1 x 3 x 1.5 inches and weight of 326g or 11.5 oz when you include its “wall-wart” power adapter. However, it’s also the most advanced, with the ability to analyze your batteries and show their actual capacity in mAh or their voltage output on independent LCD readouts. This allows you to determine which of your batteries are the best-performing of the bunch, which may be useful if you’re a professional photographer or someone who just needs the best performance they can get from their batteries. It’s typically available on Amazon for around $30 . Since it’s definitely pushing it when it comes to being sized for travel, you might consider keeping one of these at home and getting one of the smaller chargers above for when you’re on the road. If you’re willing to trade some of the features of the BC-700 for size, you may be interested in its younger brother, the La Crosse BC-500. It’s smaller at 124 x 66 x 22 mm or 4.9 x 2.6 x 0.9 inches, weighing 70g or 2.5oz (not including its power adapters). 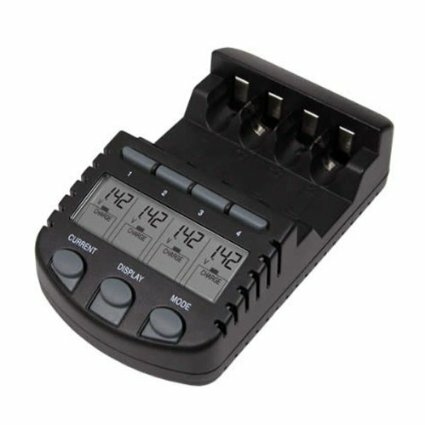 One advantage that this charger has over the others listed here is that, in addition to the standard “wall-wart” power adapter, it includes a 12V cigarette lighter adapter, making it ideal if you occasionally need a charger for car camping trips or for your boat. The LCD shows charge voltage and percent charge completed while charging. 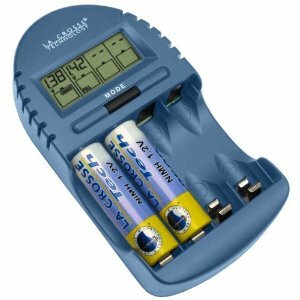 It has a basic refresh function (labeled DISCHARGE) where it discharges and recharges your batteries, and a test function, where it will fully charge, fully discharge, then fully recharge your batteries to tell you the measured capacity of the battery. It lacks the ability of its older brother, the BC-700, to select the charge rate, and is instead locked to a charge rate of 500mAh, giving typical charge times of about 4 hours for 2000mAh batteries (i.e. 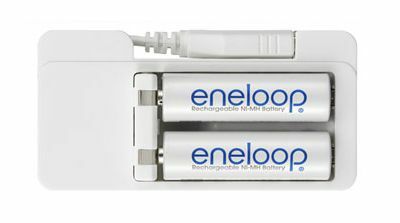 Eneloop or equivalent low self-discharge batteries) or 5 hours for the two standard 2600mAh NiMH batteries which are included. It’s available from Amazon with the price ranging from about $30 to $40. The Maha Powerex MH-C9000 is the charger you’re referring to, and yes a lot of battery geeks prefer it to the LaCrosse chargers, although they are very similar in function. However, when it comes to size and portability, the MH-C9000 isn’t exactly travel-friendly at 6.5″ (16.5cm) x 4.33″ (11cm) x 1.7″ (4.3cm). If you look at the MH-C9000 on Amazon , one of the customer uploaded images by NLee the Engineer shows the size difference between the two chargers, and it’s pretty significant. It does have the ability to charge from 12V as you mentioned, which is useful for those needing to charge their batteries in their car or boat.